Early on 19 February, the assault ships of Task Force 53 under Admiral Hill arrived off Iwo Jima and joined Admiral Blandy's Amphibious Support Force. As dawn rose over Iwo Jima, more than 450 ships of the Fifth Fleet lay offshore, the largest armada ever assembled thus far for a military operation in the Pacific Theater. It was apparent by early morning that the landing force would encounter favorable weather. The sea was relatively smooth and surf conditions were satisfactory. The sky was clear; visibility was virtually unlimited, and the temperature was 68 degrees. Wind velocity was eight to ten knots from the north. and Covering Force hurled tons of high explosives into the island. This was the last chance to silence the heavy enemy guns that dominated the boat lanes and beaches, and the gun crews of the North Carolina, Washington, New York, Texas, Arkansas, and Nevada. turned-to with grim determination. As shell bursts flicked flame, smoke, and chunks of Iwo into the air, it appeared as if the bombardment were intended to blow the very island out of the sea. Even the dead crater of Mount Suribachi seemed to come to life as it steamed from successive hits along its lip. Blasts, following one another in close succession, rocked the beaches, the airfields, and the northern portion of Iwo with its numerous hills and gullies. In addition to the heavy gunfire ships, the gunboat and mortar support groups participated in the preparatory fire. The latter groups consisted of 42 LCI gunboats. Twelve of the LCIs were armed with 4.5-inch rockets and 40mm guns; 18 carried 4.2-inch mortars, and 9 were equipped with 5-inch rocket launchers.4 The LCIs joined the bombardment by the big ships at 0730 and, throughout the morning, expended nearly 10,000 rockets and large quantities of mortar ammunition while showering the slopes of Mount Suribachi and the high ground to the north of the beaches with rocket and mortar fire. The prelanding bombardment proceeded exactly as scheduled. A few minutes after 0800, the naval guns lifted their fire and 120 fighters and bombers of TF 58 swept over the island in two waves. The aircraft concentrated their attack against the slopes of Mount Suribachi, the landing beaches, and the high ground to the north of the landing beaches. Following the bombing and strafing by the first wave, the second arrived over the island and unleashed napalm, rockets, and machine gun fire against the defenders. Included in the second wave were 24 Marine F4U Corsairs under the command of Lieutenant Colonel William A. Millington, commanding VMF-124 on board the Essex. Megee had admonished the fighter squadron commander to "go in and scrape your bellies on the beach"6 and that is precisely what Millington proposed to do. At 0825, the naval bombardment resumed. Since only a half hour remained before the first assault wave would hit the beaches, all available fire was directed against the landing sites. As the last phase of the pre-assault bombardment got under way, air bursts were employed to annihilate any Japanese that might be caught out in the open. The naval gunners subsequently shifted to impact rounds as time for the approach of the first assault wave grew near. During the final 15 minutes of the bombardment, the naval vessels offshore blasted the invasion beaches with everything they had. The thunderous roar of the 16-inch guns was supplemented by the sharper bark of the 5- and 8-inch guns of the destroyers and cruisers. Rocket craft unleashed their fire, and mortar boats shelled inland to a depth of about 1,000 yards. As the assault troops approached the shore, the naval bombardment shifted ahead to provide the mightiest preinvasion shelling thus far experienced in the Pacific Theater. In less than 30 minutes, more than 8,000 shells smashed into the beach area. to frustrate the imminent landings. The Marines about to hit the hostile beaches would be the first to know for certain how strongly the enemy could still react to their amphibious assault. For the Marines in the assault waves, D-Day had started with the traditional meal of steak and eggs. Shortly after 0800, while naval shells were rocking Iwo, the amphibian tractors carrying eight Marine battalions to the Iwo beaches were churning in the water. A line of departure had been established about two miles offshore and parallel to the beach. At each end of this line, a control vessel was stationed to mark its boundaries. A central control vessel occupied the middle of the line. Along the line, at regular intervals, small vessels marked the boat lanes. The assistant division commanders, Brigadier General Franklin A. Hart for the 4th Marine Division, and Brigadier General Leo D. Hermle for the 5th, stationed themselves at each end of the line of departure as observers. Boated and circling, the first three waves were ready to cross the line of departure by 0815. It was from here that the Marines watched the island take a severe pounding from the naval shelling and cheered as the supporting aircraft unloaded their lethal cargo over the island. The men approaching Iwo Jima were fully aware of what lay ahead; there had been no attempt at concealing the fact that a tough and costly battle awaited them. Men of the 4th Marine Division were going in with the prayer of their commander, General Cates, that as many of them as possible might be spared. General Schmidt felt that it would be a bitter but short fight. turning right and left respectively to positions from where they continued to support the flank battalions. The operations plan had allowed 30 minutes for each assault wave to travel the 4,000 yards from the line of departure to the beaches. Following the first, successive waves crossed the line at 250- to 300-yard intervals. The second assault wave, consisting of 1,360 Marines in LVTs, crossed the line of departure two minutes behind the first wave. Eight more waves formed behind the first two, to be landed at five-minute intervals. The plan called for 9,000 men to be ashore in somewhat less than 45 minutes. When the leading wave had reached a point 400 yards offshore, the naval bombardment shifted to the interior of the island and to the flanks. At the same time, Lieutenant Colonel Millington's fighters streaked down in magnificent strafing which continued relentlessly as the LVT ( A)s approached the beaches. In accordance with their orders, the pilots, who earlier that morning had executed the napalm and rocket strike against Iwo, now hit the beaches in daring low-level attacks. Just as the first wave came ashore, the planes shifted their strafing runs about 500 yards inland. The ship-to-shore movement of the assault waves was carried out according to schedule. The first wave landed between 0859 and 0903; the second and third waves came ashore at two-minute intervals. The defenders remained strangely silent as the first assault troops approached the beaches, and the initial waves were not subjected to any enemy antiboat fire during the final approach to the objective. For some of the Marines, a small sliver of hope began to emerge that the heavy bombardment had reduced the enemy to impotence. Up to the point where the first LVT (A)s emerged from the water and ground forward, the entire maneuver had been executed with parade-ground precision. For the incoming Marines, the only indication of the enemy's presence on the island thus far had been confined to the air. One moment, a 5th Marine Division observation aircraft was circling lazily overhead; the next, enemy antiaircraft fire scored a direct hit and the small airplane spiralled into the surf. The first tractors had no sooner reached the beach and commenced heading inland than it was discovered that the 15-foot terrace directly behind the beach blocked their fields of fire. The height and steepness of the terrace was the first unpleasant surprise that the Marines were to encounter on Iwo. A second one was not long in coming. As the Marines of the 4th and 5th Divisions swarmed from their vehicles, it became evident that the composition of the volcanic sand was not what had been expected. Instead of sand with sufficient consistency to support at least tracked vehicles and men on foot, Marines of the landing force, many of them weighted down with more than 100 pounds of weapons and other gear, found themselves floundering in a sea of soft volcanic ash that all but precluded their ascending that 15-foot seawall. Almost immediately, the Marines sank up to their ankles into the loose ash that tugged at their feet and made all forward movement a strenuous undertaking. Some of the amphibian tractors never slackened their speed upon reaching the beaches but pushed their way straight inland, up the first terrace and beyond it until they had advanced between 50 and 75 yards. Those LVT (A)s failing to negotiate the incline headed back out to sea, where they turned around and fired inland. At 0907, the third wave of 1,200 men went ashore, followed about five minutes later by another 1,600 men of the fourth wave. Successive assault waves followed closely behind the first ones. There still was no organized enemy opposition though a few isolated artillery and mortar shells began to fall in the surf as the later waves neared the shore. Except for a number of land mines, the beaches were found clear of man-made obstacles. 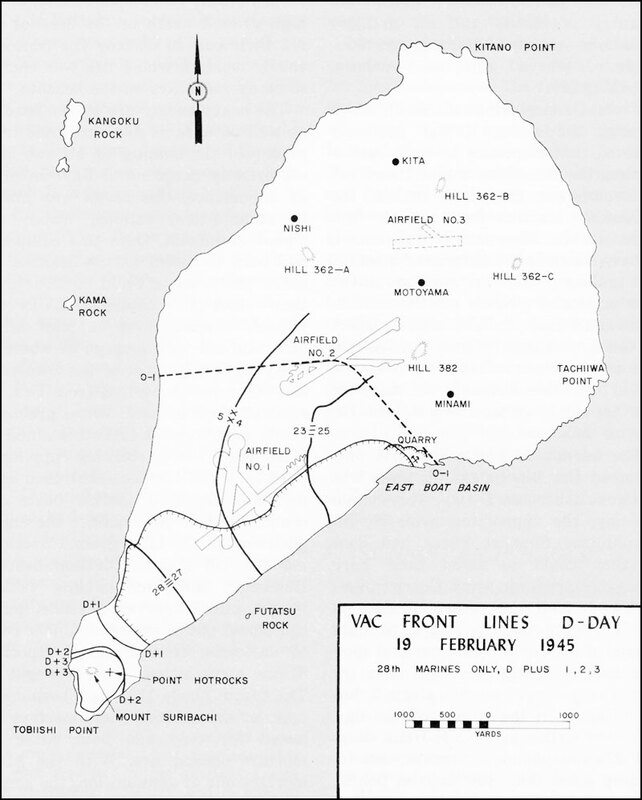 The eight battalions of the 4th and 5th Marine Divisions that landed abreast on the southeastern shore of Iwo Jima were 1/28, commanded by Lieutenant Colonel Jackson B. Butterfield, and 2/28, commanded by Lieutenant Colonel Chandler W. Johnson, on Green 1; 2/27, under Major John A. Antonelli, on Red 1; 1/27, under Lieutenant Colonel John A. Butler, on Red 2; 1/23, commanded by Lieutenant Colonel Ralph Haas, on Yellow 1; 2/23, under Major Robert Davidson, on Yellow 2; 1/25, headed by Lieutenant Colonel Hollis U. Mustain, on Blue 1; and 3/25 under Lieutenant Colonel James Taul, on the southern edge of Blue 2. As the men headed inland, the Japanese gradually came to life. The first among the landing force to feel the enemy reaction were the men of Major Davidson's 2/23 on Yellow 2 in the 4th Division sector. A moderate amount of mortar fire hit the beach within two minutes after the first wave had landed. Within 15 minutes, Marines on the Yellow and Blue beaches were reporting heavy enemy mortar fire. To the south, on the Red Beaches and Green 1, 5th Division Marines started to advance inland against initially light opposition. By 0930, 1/28 had moved 150 yards inland. Ten minutes later, the battalion reported receiving heavy mortar fire from the left flank. By the time the advance had covered 300 yards, the men were sprinkled, showered, and ultimately deluged by mortar and artillery fire from Mount Suribachi, as well as from the high ground to the north of the landing beaches. The loose, slipping sand offered poor cover; foxholes filled in almost as fast as a man could shovel, and urgent requests for sandbags began to fill the air waves. By 0935, Green 1 and the Red Beaches were on the receiving end of a heavy mortar barrage. Marines moving inland drew intense machine gun and rifle fire from well concealed pillboxes, blockhouses, and caves as soon as they left the protective cover of the first terrace. out on the beaches only to become bogged down in the treacherous volcanic ash even before they had cleared the ramp. Many of the small craft, their bows pinned to the beach, broached and swamped. Despite the enemy fire, congestion at the water's edge, and initial confusion accompanying the landings, men and supplies continued to pour ashore. Within an hour and a half from the time that the Marines of the first wave had set foot on the island, all of the eight assault battalions were ashore. At 1005, three LSMs carrying 16 tanks of Lieutenant Colonel Richard K. Schmidt's 4th Tank Battalion hit the Yellow Beaches. The tanks encountered considerable difficulty in getting ashore. Even then, their troubles were far from over, and three tanks struck mines less than 150 yards in from the water. While the naval barrage was still providing cover, the four newly landed Marine regiments prepared to reorganize and begin the push inland. From north to south these regiments were the 25th Marines, commanded by Colonel John R. Lanigan, and the 23rd Marines under Colonel Walter W. Wensinger, both belonging to the 4th Marine Division. The 5th Marine Division was represented by the 27th Marines, led by Colonel Thomas A. Wornham, and the 28th Marines under Colonel Harry B. Liversedge. advance about 350 yards inland, then turn southward towards Mount Suribachi. At 0935, 2/28 started to land on Green 1 behind 1/28. Its mission was to take up positions facing Mount Suribachi, protecting the left flank of the landing force. By this time, heavy mortar and artillery fire was enveloping the beaches, making reorganization of the companies difficult. As the 1st Battalion launched its 700-yard sprint for the western shore with Companies B and C abreast, accurate enemy small arms fire from concealed positions began to rake the advancing Marines. It soon became evident that the advance would prove costly. The intensity of the enemy fire all but precluded a coordinated movement. Men advanced in small groups, heedless of security to their flanks; some units were temporarily pinned down by an enemy who remained largely invisible. Between the bursts of artillery and mortar shells all around them, the Marines strained to get a glimpse of the defenders. What they saw was not reassuring, for halfway across the island a maze of mutually supporting blockhouses and pillboxes extended across the entire front. In a situation where movement threatened to bog down in the heavily fortified area, the courage of individual Marines kept the attack rolling. Among the first to distinguish himself was Captain Dwayne E. Mears, commanding Company B. Armed with only a pistol, the company commander personally assaulted a pillbox that was retarding the advance of his company. Despite a wound that later proved to be fatal, Captain Mears continued to attack successive enemy positions until he became too weak to move.12 On the right, Captain Phil E. Roach led the advance of Company C across the island, carefully maintaining the same rate of progress as Company B. While assaulting a heavily fortified position, Captain Roach also became a casualty. Many men who found themselves separated from their platoons during the dash across the island formed small groups that continued to advance independently, thus helping to preserve the momentum of the attack. The success of the 28th Marines' attack owed much to the support provided by the 60mm mortars which maintained continuous fire against groups of Japanese that had been flushed out of their emplacements. This fire kept the enemy on the run and out in the open, where he presented a visible target to the advancing riflemen. Lieutenant Richard H. Sandberg, commanding Company A's mortar platoon, spotted an enemy 90mm mortar squad and concentrated his fire on the Japanese until they were forced to abandon their weapon. Even more remarkably, in the heat of the engagement this platoon leader was observed firing a 60mm mortar with amazing accuracy, though it was without a base plate.13 Before noon, Lieutenant Sandberg became a casualty and had to be evacuated. only the platoon leader, Lieutenant Frank J. Wright, and four men of the 1st Platoon, Company B, made it all the way across the island. Lieutenant Wesley C. Bates, leading the 2d Platoon, and six of his men reached the western beach around 1100 and joined forces with Lieutenant Wright. Even though elements of the 1st Battalion had now crossed the island, bypassed enemy positions continued to offer fierce resistance. Company A, which had landed in 1/28 reserve and faced south towards Mount Suribachi to protect the battalion's left flank, was now relieved by 2/28 and joined the remainder of the 1st Battalion in mopping up. Because of the heavy casualties 1/28 had sustained, Colonel Liversedge requested the release of 3/28, the division reserve, to his control. General Rockey granted this request. The battalion, boated and prepared to land on any 5th Division beach, received the order to land at 1210. Ten minutes later the first boats crossed the line of departure. As the leading wave approached the shore, heavy fire from Mount Suribachi and the high ground north of the landing beaches was directed at the boats. This unit suffered many more casualties during the ship-to-shore movement than had the 1st and 2d Battalions. Shortly after 1300, all elements were ashore, though it was not until late afternoon that the battalion was able to edge its way into the line. Following a naval gunfire preparation, and with adequate air support, the 2d and 3d Battalions were to jump off jointly at 1545 to attack south towards Mount Suribachi. For such an attack, the support of armor was necessary. Company C of the 5th Tank Battalion was therefore ordered to land in direct support of the 28th Marines. This company had 14 Sherman M-4 tanks, two flametanks, one tankdozer, and one retriever. When they landed on Red One Beach about 1130, the tanks found it rough going because soft sand and storm terraces made exit difficult and the first terrace was mined. By the time additional elements of the 5th Tank Battalion got ashore, the beach was congested by stranded wheeled vehicles disabled by enemy fire. The increasing concentration of men and equipment in a restricted area was beginning to cause considerable confusion. The tanks of Company C eventually exited the beach by a road between Red Beach 1 and 2, arriving in the zone of action of 1/28 about 1400. Lieutenant Colonel Butterfield's battalion at the time was pinned down, suffering casualties from Japanese fire coming from pillboxes and blockhouses bypassed earlier. It was decided to use the entire tank company in cleaning up the area. Because of minefield and tank traps, the tanks advanced in a column which came under antitank fire immediately after moving out. Armor piercing shells penetrated the turrets of two tanks, each of which suffered three casualties. Shortly thereafter, the enemy scored a hit on a third tank, rendering the turret inoperative. The tankers ultimately knocked out the hostile gun. This completed their mission with 1/28. About 1600, the tanks formed up to support 2/28 and 3/28 in the planned attack towards Mount Suribachi but enemy fire was so heavy that the attacking battalions could not get into their proper positions. The 3d Battalion, commanded by Lieutenant Colonel Charles E. Shepard, Jr., was unable to get into jumpoff positions alongside the 2d Battalion. The tanks of Company C had moved out about 200 yards when it was observed that the troops on the right were not moving. By the time the 3d Battalion did get on line, it was considered too late to launch the attack, and Shepard's men began to dig in for the night. Shortly before 1700, 2/28 launched an attack of its own, supported by tanks of Company C. By 1730, the battalion had advanced only 150 yards and even this slight gain, obtained at the cost of many casualties, had to be relinquished when 2/28 was ordered to fall back and tie in with the 3d Battalion for the night. The tanks of Company C thereafter found themselves in the unusual role of remaining forward of the lines, firing at pillboxes and covering the infantry units as they prepared for the night. Company C was released from this assignment about 1845. One tank, bogged down in a shell crater, had to be abandoned after the crew removed the gun mechanism and destroyed the radio. The company withdrew to a point about 300 yards from the front lines and dug in for a first night marked by almost continuous mortar fire. was infiltrating the southern end of Motoyama Airfield No. 1 and consolidating along the western edge of the field. Company C had passed the field and occupied a line extending for about 250 yards from its southwestern part to the northwest. The 2d Battalion was generally abreast of the 1st, maintaining contact with it. The 27th Marines also was receiving its share of enemy mortar and artillery fire, and casualties mounted as the advance continued. Among those wounded at this time was the executive officer of the regiment, Colonel Louis C. Plain, who was hit in the arm and subsequently evacuated. The support of armor was needed to overcome the stubborn enemy resistance, so Company A of the 5th Tank Battalion was attached to 1/27. Earlier that morning, this company had been the first tank unit ashore, landing on the Red beaches at 0925. In attempting to get off the beaches, four tanks broke their tracks in the loose sand; the engine of another Sherman malfunctioned so that it could no longer move. The remaining tanks finally found a way off the beach and proceeded towards Motoyama Airfield No. 1. With their support, 1/27 was somewhat better able to reduce the strongly defended enemy positions, although the presence of armor in the front lines proved a mixed blessing to the hard pressed Marines who found that the Shermans attracted enemy antitank fire. Even with tank support, however, the 1st Battalion was unable to make any significant advance for the remainder of the day. It was a different story with Major Antonelli's 2d Battalion, hell-bent on driving to the opposite side of the island. Moving inland from Red Beach 1, the battalion ran into heavy fire from light machine guns and rifles; progress was further impeded by the enemy's use of hand grenades. About 50 yards inland, the battalion encountered its first pillbox, one of many carefully camouflaged in this area. In accordance with their orders to cross the island as quickly as possible, Companies E and F bypassed many enemy installations, eliminating only those directly in their path. Assault teams equipped with flamethrowers and hand grenade-throwing riflemen neutralized the Japanese inside while engineer teams blew up the pillboxes with explosive charges. Leading a machine gun platoon of 1/27 past the southern end of Motoyama Airfield No. 1 was Gunnery Sergeant John Basilone, know as "Manila John" and famous for his exploits on Guadalcanal in October 1942 that had won him the Medal of Honor. On Guadalcanal he had thwarted a Japanese assault by alternately firing two machine guns and a pistol. His presence on Iwo Jima was his own choice; he had previously turned down a commission in favor of remaining an enlisted man. As Manila John rushed for the west coast of Iwo, a few steps ahead of his men, a mortar shell suddenly burst close behind him, mortally wounding this great fighting Marine and four of his men. and seized the cliffs overlooking the west coast by mid-afternoon. The regimental reserve, 3/27 under the command of Lieutenant Colonel Dorm J. Robertson, had landed at 1130 and, moving up behind 2/27, assisted in mopping up positions bypassed by the 2d Battalion. Despite heavy Japanese shelling of the entire beachhead on D-Day, additional units arrived on shore throughout the day. At 1500, 1/26, commanded by Lieutenant Colonel Daniel C. Pollock, completed its landing and moved into an assembly area about 300 yards inland from Red Beach 1. Shortly thereafter, the battalion was attached to the 27th Marines and ordered to take up defensive positions behind 2/27. Company B, 5th Tank Battalion, began landing on Red Beach 1 at 1300. As in the case of the armor that had landed earlier, the tanks encountered trouble in getting off the beach, but by 1600 they had reached the western side of the island, where they were attached to the 27th Marines. Meanwhile, the 26th Marines, under Colonel Chester B. Graham, had spent most of the day on board ship in corps reserve. Just before 1000, General Schmidt released the regiment, less the 1st Battalion, to its parent division; the 21st Marines of the 3d Marine Division became the corps reserve. 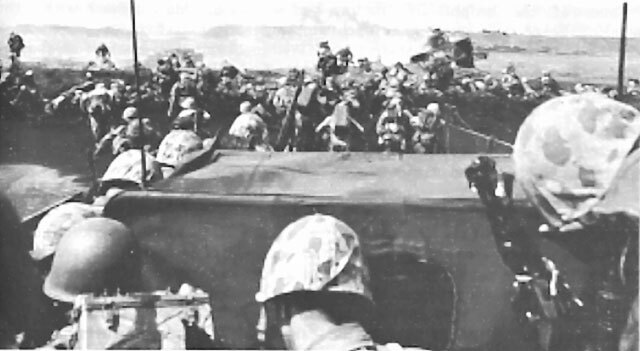 The 26th Marines was ordered to proceed to the line of departure shortly after 1100, but the crowded condition of the beaches and limited space inland precluded a landing until late afternoon. It was 1730 before Colonel Graham's regiment finished coming ashore over Red Beach 1. The regiment moved into on assembly area just south of Motoyama Airfield No. 1, where it took up defensive positions. The four artillery battalions of the 13th Marines, commanded by Colonel James D. Waller, were also preparing to go ashore. Reconnaissance parties sent to the beaches as early as 1030 had discovered that the previously selected battery positions were still in enemy hands. As a result, 3/13, under Lieutenant Colonel Henry T. Waller, did not reach the island until 1400. Half an hour later, 2/13, commanded by Major Carl W. Hjerpe, went ashore, to be followed at 1645 by 1/13 under Lieutenant Colonel John S. Oldfield. Major James F. Coady's 4th Battalion reached Iwo between 1930 and 2000. The darkness and enemy fire took their toll of 4/13. Three DUKWs swamped; their cargo, consisting of two guns and badly needed radio equipment, was lost. the morning because their access road was blocked by crippled LVTs. Landing four artillery battalions on beaches that were still exposed to incessant enemy fire was a hazardous undertaking. When the DUKWs of the Marine 5th and the Army 471st Amphibian Truck Companies reached the beaches with their cargo of 75mm and 105mm guns, they found it difficult to negotiate the deep sand. The wheeled vehicles could not get over the steep terrace behind the beaches until bulldozers and LVTs were pressed into service to pull them over the crest. Inland, the cargo was unloaded amidst heavy mortar and machine gun fire, while many furiously working artillerymen used their helmets and whatever else they could lay hands on to dig gun pits. The 13th's guns got over the south beaches somehow, and up the terraces. Within thirty minutes the crack of artillery, clearly recognizable to the foot soldiers, gave heart to the men on both fronts. Sergeant Joe L. Pipes' "Glamor Gal" was first to fire on Suribachi. At about the same instant, Sergeant Henry S. Kurpoat's 75 let go from behind Yellow 2, firing north. Most of the artillery managed to get ashore. From that time on, the Japanese no longer had it all their way, though they retained the capability of inflicting major punishment on the assault force for some time to come. The experience of the 13th Marines is typical of what was accomplished on D-Day and of the difficulties all Marines were to encounter on Iwo Jima. The 3d Battalion, going ashore at the northern end of Green Beach, went into position close to the water's edge. Within 20 minutes, one section of the 105mm guns was registered; by 1745, all guns were in position and ready to support the 28th Marines. Throughout D-Day, reinforcements poured ashore as the organizational component of the landing force began to build up. At 1430, General Hermle went ashore with the ADC group and a headquarters reconnaissance party and established an advanced 5th Division command post. The assistant division commander, the first American general officer to set foot on the island, crossed Motoyama Airfield No. 1 while it was still under heavy enemy fire and gained first-hand information from units in the front lines. tires of wheeled vehicles, miring them axle-deep; the steep terraces blocked egress from the beach and extensive minefield took a heavy toll. Debris piled up everywhere. While 5th Division Marines struggled for the southern portion of Iwo Jima, fierce action developed on the northern beaches, where General Cates' 4th Division had gone ashore. Precisely at H-hour, Colonel Walter W. Wensinger's 23d Marines had landed on the Yellow beaches with two battalions abreast. The 1st Battalion, commanded by Lieutenant Colonel Ralph Haas, landed over Yellow 1; the 2d Battalion, under Major Robert H. Davidson, landed to the right over Yellow 2. As in the 5th Division sector to the south, RCT 23 encountered little initial resistance until the two assault companies reached the second terrace. At this point, they began to draw heavy and accurate fire from the front and flanks, where the enemy was very much alive and firmly entrenched in pillboxes, ditches, and spidertraps. Squarely astride the regiment's front were two huge blockhouses and 50 pillboxes. Even though the blockhouses had sustained massive damage from the pre-landing bombardment, they still afforded cover for the enemy. Before an advance inland could get under way, the formidable enemy obstacles had to be eliminated, a task requiring the employment of armor. discharge casualties. At 1245, LSM 216 finally succeeded in landing its tanks on Yellow 1. These tanks proceeded inland, but were unable to locate a route to the hard pressed 2/23. Nor was such a route ever found on D-Day. Thus, only 1/23 received any tank support on 19 February, and due to difficult terrain and heavy enemy resistance, this support was relatively ineffective. Colonel Wensinger eventually requested that two tank retrievers be landed to assist the assault tanks which were in trouble along the beach. Some progress was made, but the nature of the terrain and heavy mortar and artillery fire from the flanks severely hindered retrieving operations. RCT 23 had to fight its way forward with limited armored support. A hail of shells and small arms fire took a heavy toll of casualties. It was generally agreed that of all the unpleasant beaches on Iwo that day, those of the 4th Division were the hottest. At 0930, 1/23 reported that its forward elements had advanced 250 yards inland. Continued progress was slow. Ten minutes later, 2/23 sent word that it had advanced inland a similar distance, but that its leading elements were pinned down by machine gun fire from pillboxes to its front and flanks. At noon, 1,/23 had advanced 500 yards further inland to within 200 yards of Airfield No. 1. The advance of the 2d Battalion, still meeting intensive resistance, was lagging. In fact, 2/23 had made only 250 yards since its earlier report. The absence of tank support for the 2d Battalion was beginning to make itself felt; at the same time, it became apparent that such support would not be available for some time. In view of this situation, the regimental commander decided to land 3/23, the reserve battalion, commanded by Major James S. Scales. The battalion received orders at 1300 to land along Yellow 1 Beach, move 200 yards inland, and support the attack of 2/23 with 81mm mortars. Upon going ashore, the reserve battalion came under very heavy mortar and artillery fire. Fortunately, none of the landing craft received direct hits during the approach to the beach. Once they had come ashore, it was a different story; enemy shells could not help but hit something on the congested beaches, and casualties and destruction of materiel caused serious disorganization. More trouble for the landing force on the beaches was in the offing, and for a time it appeared as if nature had joined hands with a stubborn and determined enemy to thwart the invasion of Iwo. At the same time that the intensity and accuracy of enemy fire on the beaches reached a climax, the surf began to rise. As LVTs bogged down or were hit, the congestion and confusion on the beaches grew immeasurably. But no real trouble developed until the arrival of the LCVPs. As the light boats hit the beaches, the surf broke over them, broaching some and swamping others. Other boats, some already disabled, piled in behind the first ones and were soon hurled on the beach by the waves. often every yard gained was paid for in blood. In the. zone of attack of RCT 23, tanks finally reached the front lines during the afternoon. The left flank of 1/23 had advanced to the edge of Airfield No. 1 shortly after 1400, but heavy antitank fire forced the armor to beat a hasty retreat behind the revetted edge of the field. In order to get 3/23 off the congested beaches, Colonel Wensinger ordered the battalion to pass through 1/23 and carry the attack across the airfield. This order was partly carried out despite casualties and confusion, and, by 1700, 3/23 had reached the airfield boundary. The 2d Battalion derived little benefit from the arrival of armor in its zone of attack, where enemy mines, the soft volcanic ash, and accurate enemy fire precluded effective tank support. By 1730, Company F was barely able to reach the apron of Airfield No. 1, and there halted its advance for the remainder of the night. As a result of the heavy resistance encountered by the 23d Marines, General Cates shortly after 1400 committed two battalions of the division reserve, the 24th Marines, commanded by Colonel Walter I. Jordan. The 1st and 2nd Battalions were to be attached to the 25th and 23d Marines respectively. At 1615, 2/24, under Lieutenant Colonel Richard Rothwell, was ordered to land on Yellow Beach 2 to relieve 2/23. Shortly before 1700, the battalion landed and moved inland about 700 yards to the front line. By 1800, it had relieved 2/23 and dug in for the night just short of the airfield, tying in between 2/23 and 1/25. Among all of the Iwo beaches, the one most exposed to enemy fire was Blue Beach 1, the northernmost of the invasion beaches, located right below a cliff that was held by the enemy in great strength. It was the unenviable task of the 25th Marines to secure the Blue Beaches. The regiment, under Colonel John R. Lanigan, landed two battalions abreast over Blue Beach 1 and the southern edge of Blue Beach 2. As on the remaining beaches, the first waves, landing shortly after 0900, reported only light enemy fire until the troops disembarked and moved approximately 25 yards from the LVTs, when they came under very heavy machine gun, mortar, artillery, and rocket fire. of his mortars, artillery, and antitank guns on the tank landing ships (LSMs). All three of the LSMs were hit and damaged while unloading. The enemy fire could not prevent the LSMs from landing, but caused a delay in launching the tanks. After having discharged the tanks, the LSMs retracted from the beach. A tank dozer cut a road from the first terrace inland from Blue Beach 1, but became a total loss when it hit a mine and turned into a sitting target for Japanese mortars and artillery. The remaining tanks formed a column and gingerly proceeded inland for about 100 yards. At that time, the column came to a halt when it encountered an enemy minefield. Though immobilized for the time being, while engineers cleared the mines, the tanks supported the Marine riflemen with their 75mm guns, which fired on enemy positions and pillboxes behind the beach and in the cliffs to the north. was attached to 3/25. Units began digging in at 1700 and firm contact was established along the front of RCT 25 except on the left flank where a 75-yard gap remained. This gap was covered by fire and observation during the night. In the course of the evening, the depleted 3/25 was relieved by 1/24 and took up defensive positions to the rear of 1/24. The relief, which took place under occasional enemy fire, was not completed until close to midnight. The last battalion of the 24th Marines to go ashore was 3/24, under Lieutenant Colonel Alexander A. Vandegrift, Jr. The battalion landed before 1900 and moved inland a short distance from Blue Beach 2. All of the 4th Marine Division's infantry battalions were now ashore, and Marines were busily making preparations for an enemy counterattack they felt sure would develop during their first night ashore. As in the 5th Marine Division sector on the southern beaches, additional units reached Iwo on the northern beaches during D-Day. With most of the infantry ashore, the time had also come for the artillery regiment of the 4th Division, under Colonel Louis G. DeHaven, to land on the island. Reconnaissance parties from the artillery battalions had already debarked early in the afternoon in order to select positions for their batteries. In doing so, they faced difficulties similar to those encountered by the 13th Marines on the southern beaches. The front lines had advanced more slowly than planned; no routes had been cleared to enable the DUKWs to carry artillery pieces inland. One of the first members of the reconnaissance teams to become a casualty was Lieutenant Colonel Robert E. McFarlane, commanding the 3d Battalion. At 1405, General Gates ordered 1/14 under Major John B. Edgar, Jr. to land in direct support of the 25th Marines; Major Clifford B. Drake's 2/14 was to lend direct support to RCT 23. Upon hitting Blue Beach 1, the DUKWs of the 4th Amphibian Truck Company with their cargo of 75mm Pack Howitzers of 1/14, became immobilized at once. They quickly bogged down and settled in the volcanic ashes. Bulldozers attempting to get the DUKWs mobile again tugged and strained, but more often than not cables snapped and towing cleats sheered. One howitzer was lost when the DUKW in which it was loaded sank immediately after being discharged from its LST.25 Nevertheless, by 1715 the 1st Battalion had succeeded in getting 11 howitzers into position after wrestling them up the terraces by hand. Half an hour later, all batteries of 1/14 were registered and ready to fire. An even more difficult feat was to get the 105mm howitzers of 2/14 ashore. Because of the increased weight of these guns, it proved impossible to manhandle them up and over the terrace. The only feasible expedient was to keep each howitzer in the DUKW and then attempt to get the loaded DUKWs over the terrace. Surf conditions, the slippery sand, and continuous enemy fire combined to make this movement a miserable undertaking that took hours to complete. None of the DUKWs received a direct hit, though several casualties resulted from near misses. Shortly before dusk, all 12 howitzers of Major Drake's 2/14 were in position near Yellow Beach 1. The 3d Battalion, under Major Harvey A. Feehan, was ordered to launch its DUKWs shortly after 1500. At this time, for unknown reasons, several DUKWs could not be started and more than an hour elapsed before all of the vehicles were in the water. Because of the congestion ashore and approaching dusk, Colonel DeHaven decided that the 3d and 4th Battalions were to delay going ashore until the following day, and 3/4 was reembarked on board the LST. During the reembarkation, a howitzer and a DUKW were lost when the amphibian truck's motor failed as it headed back up the ramp. As D-Day on Iwo Jima came to an end, Marines all along the VAC front lines braced for a major Japanese counterattack they felt sure would come before the night was over.26 The carnage which had taken place on the island on D-Day differed from anything the Marines had encountered elsewhere in the Pacific Theater during World War II. Despite the enemy presence, which made itself felt everywhere and continuously on the island, and to which the numerous dead and wounded could attest, few of the men who had landed on Iwo that day had actually seen a live Japanese. No prisoners had been taken that first day, and only an occasional enemy corpse was visible. Nevertheless, a steady flow of American casualties from the front to the beaches underscored the ferocity of the enemy resistance. Along the surf line, the litter of war continued to pile up in an almost unimaginable jumble: smashed landing craft surged upward and forward with every wave, crashing headlong into trucks, crates, and bodies at the edge of the water. Nearby, the wounded were gathered in small groups sitting or lying, just as exposed to the incessant enemy shelling as anyone else on the island and even more helpless in the face of it. For the remainder of D-Day, and into the night, boats approached Iwo Jima, loaded with reinforcements and supplies; having unloaded these, they took on a new cargo: the wounded, for whom surgeons would be waiting in transports and hospital LSTs especially prepared for this purpose. garrison. Even though the advance nowhere came near to reaching the 0-1 Line, VAC had succeeded in getting six infantry regiments and six artillery battalions--nearly 30,000 men and thousands of tons of equipment--ashore. (See Map 28). From General Holland Smith down through the ranks, it was generally believed that according to their earlier tactics, the Japanese would throw all the manpower they had against the vulnerable Marines during their first night ashore. 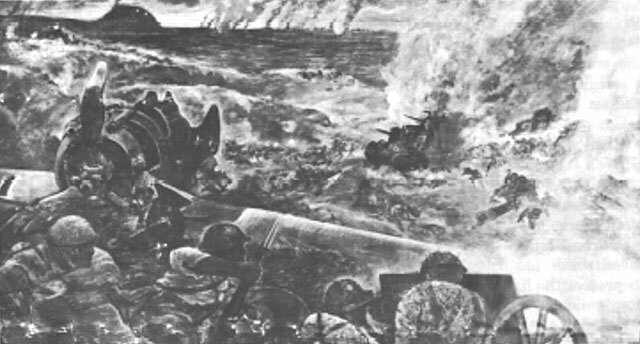 The enemy was known to have a large reserve force of infantry and tanks available for such an all-out counterattack.28 None of the intelligence personnel of VAC could suspect at the time that General Kuribayashi planned to conserve his manpower and would find other means to decimate the Marines that were crowded into the narrow beachhead. The heavy enemy fire on the beaches, as well as unfavorable surf conditions, precluded the landing of all but highest priority cargo on D-Day. In order of importance, this cargo was limited to ammunition, rations, water, and signal equipment. Once this equipment had been unloaded on the beaches, the shore party teams could do little more than stack the supplies. 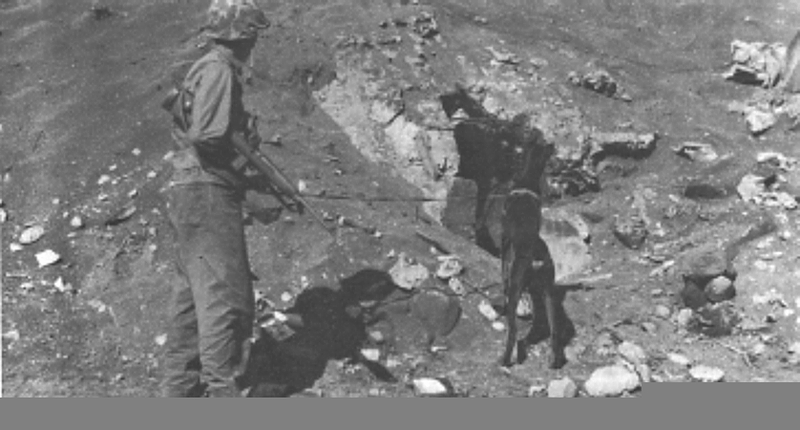 LVTs and weasels carried these supplies inland and returned with a cargo of wounded. While the Marines anxiously awaited the big banzai charge that would finally bring the enemy out into the open, General Kuribayashi cannily began to employ his plan which would destroy the Americans and their supplies on and near the beaches without his risking many of his own men. In short, his plan consisted of a few attempts at infiltration, while at the same time stepping up the fire of his deadly artillery and mortars against the crowded American beachhead. As the night progressed, the rain of enemy shells mounted in intensity, as did the number of American casualties. Despite the heavy casualties, on the evening of D-Day VAC still rated the combat efficiency of the assault force as very good to excellent.32 As the day ended, the 5th Marine Division had established a beachhead approximately 1,500 yards wide and 1,000 yards in depth, dividing the enemy forces in the northern and southern part of the island and effectively isolating Mount Suribachi. The 4th Marine Division had reached a line extending northward and inland from Blue Beach 2 for about 200 yards on low ground, then from the Quarry on top of the ridge for about 300 yards, then south across the low ground which led off the beach towards Motoyama Airfield No. 2, and from there to a line which was roughly a projection of the main runway of Airfield No. 1. It was clear that the landing had been successful. The Marines were dug in and occupied positions that were difficult but tenable. Supplies were scanty but sufficient for immediate needs. and crashing of the enemy artillery and mortar shells deluging the 30,000 Marines that had gone ashore, there was stealthy movement as some of the enemy, their guns near Mount Suribachi rendered useless by American air and naval bombardment, moved through the lines and headed for northern Iwo. The enemy had lost a good part of his artillery, and within three hours after H-Hour, all of the heavy guns on the slopes of Mount Suribachi had been silenced. There were several enemy attempts at infiltration. Shortly after 2300, a barge carrying 39 Japanese approached the west coast of Iwo and prepared to land them. The enemy was spotted by alert riflemen of 1/28, who picked the Japanese off one by one as they tried to get ashore, until all had been killed.33 On the east coast of Iwo a member of a naval construction unit had a strange experience. He was watching a log in the surf which the current bore south along the shore. Suddenly, the log made a sharp turn. The Seabee fired 13 rounds and at dawn found a riddled Japanese body at the water's edge. Japanese artillery kept pounding the American positions. Shortly after midnight, the enemy scored a direct hit on the command post of 1/23 on Yellow Beach 1, killing Lieutenant Colonel Haas and the regimental operations officer, Captain Fred C. Eberhardt. Minutes later, one of the giant spigot mortar shells, which many Marines first thought to be a P-61 night fighter because of the peculiar sound it made while passing over, came wobbling down from the north and exploded on one of the Green Beaches near Mount Suribachi. Around 0400, the 25th Marines ammunition and fuel dump went off with a terrifying roar. Two full boatloads of 81mm mortar shells, gasoline, and flamethrower fuel exploded, caving in foxholes for yards around. It appeared that General Kuribayashi's strategy was paying off. There had been no banzai that first night; but from dusk to dawn Japanese shells had steadily killed off Marines on the congested beaches at no cost to the enemy. As the new day dawned, it would be up to the tired Marines to strip the enemy of his excellent observation posts and firing positions, their only means of eliminating the deadly fire in which the entire landing force was engulfed. [1. Unless otherwise noted, the material in this chapter is derived from: U. S. Flt OPS Rpt, 16Feb-16Mar45; TF 51 AR; TF 52 AR; TF 56 AR; TF 56 G-3 Jnl, 26Jan-14Mar45, hereafter TF 56 G-3 Jnl; TG 53.2 AR, 19Feb-4Mar45, hereafter TG 53.2 AR; PhibGru 2 AR; VAC AR; VAC G-2 Rpts; VAC C-3 Jnl, 25Jan-27Mar45, hereafter VAC C-3 Jnl; VAC C-3 PerRpt, 19Feb-26Mar45, hereafter VAC C-3 Rpt; VAC C-4 Jnl, 6-13Mar45, hereafter VAC C-4 Jnl; 4th MarDiv OpRpt; 4th MarDiv G-2 PerRpts, 19-25Feb45, hereafter 4th MarDiv G-2 Rpts; 4th MarDiv D-3 PerRpts, 8Feb-17Mar45, hereafter 4th MarDiv D-3 Rpts; 4th MarDiv D-4 PerRpts, 3Jan-19Mar45, hereafter 4th MarDiv D-4 Rpts; 5th MarDiv AR; 5th MarDiv G-1 Jnl, 19Feb-26Mar45, hereafter 5th MarDiv D-1 Jnl; 5th MarDiv D-2 PerRpts, 19Feb-26Mar45, hereafter 5th MarDiv D-2 PerRpts; 5th MarDiv D-3 Jnl, 19Feb-26Mar45, hereafter 5th MarDiv D-3 Jnl; 5th MarDiv D-4 Jnl, 19Feb-26Mar45, hereafter 5th MarDiv D-4 Jnl; Iwo Comments; Bartley, Iwo Monograph; Sherrod, Marine Corps Aviation in World War II; Craven and Cate, The Pacific; Proehl, The Fourth Marine Division; Conner, The Fifth Marine Division; Newcomb, Iwo Jima; Morehouse, The Iwo Jima Campaign; T. Grady Gallant, The Friendly Dead (New York: Doubleday and Company, Inc., 1964), hereafter Gallant, The Friendly Dead, quoted with permission. 2. Additional material in this section is derived from: Fifth Flt NGF rpt; Iwo Preliminary Gunfire Requirements; TF 53 AR; TF 56 AirRpt; TF 56 Preliminary NGF Rpt; VAC NGF and Air Rpts; Henri et. 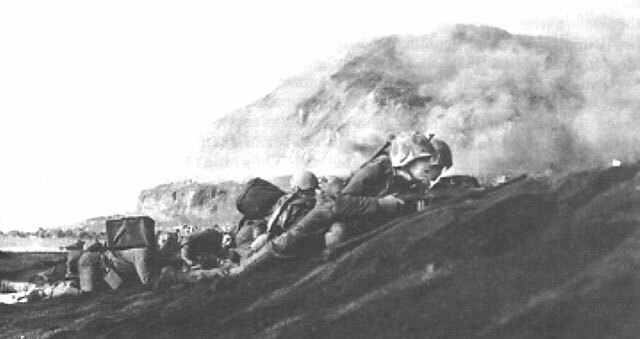 al., Marines on Iwo Jima. 3. Conner,The Fifth Marine Division, p. 43. 4. VAC NGF Rpt, pp. 25-26. 5. Bartley, Iwo Monograph, p. 51. 6. Colonel Vernon E. Megee, as quoted in Sherrod, Marine Corps Aviation in World War II, p. 347. 7. Craven and Cate, the Pacific, pp. 591-592. 8. VAC NGF and Air Rpts, p. 23. 9. Additional material in this section is derived from: TransDiv 45 AR; 2d Armd Amtrac Bn AR, 17Apr45; 1st SP Bn UJnl, 19-24-Feb45; 2d SP Bn UJnl, 19Feb-3Mar45; 5th SP Rgt. AR, n.d.; LSM Gru 13 AR, 19Feb-14Mar-45, hereafter LSM Gru 13 AR; 31st NCB AR, 9Mar45, in 5th MarDiv AR, Anx U, hereafter 31st NCB AR; 1st JASCO OpRpt, 5Apr45. 10. Henri et al, Marines on Iwo Jima, p. 34. 11. Additional material in this section is derived from: 13th Mar UJnl, 19Feb-21Mar45, hereafter 13th Mar UJnl; 23d Mar OpRpt, 9Apr45, 4th MarDiv OpRpt, Anx F, hereafter 23d Mar OpRpt; 24th Mar OpRpt, 19Feb-18Mar45, Anx G to 4th MarDiv OpRpt, hereafter 24th Mar OpRpt; 25th Mar UJnl, 18Feb-23Mar45, hereafter 25th Mar UJnl; 25th Mar OpRpt, 15Apr45, 4th MarDiv OpRpt, Anx H, hereafter 25th Mar OpRpt; 28th Mar UJnl, 19Feb-26Mar45, hereafter 28th Mar UJnl; 5th Tank Bn AR, Feb-Mar45, hereafter 5th Tank Bn AR; 1/13 UJnl, 19Feb-17Mar45, hereafter 1/13 UJnl; 1/24 OpRpt, 20Apr45, hereafter 1/24 OpRpt; 2/24 AR, 19Feb-16Mar45, hereafter 2/24 AR; 1/27 UJnl, 19Feb-18Mar45, hereafter 1/27 UJnl; 2/27 UJnl, 19Feb-23Mar45, hereafter 2/27 UJnl; 3/27 UJnl, 19Feb-23Mar45, hereafter 3/27 UJnl; 471st Amph Truck Co (Army) OpRpt, 17Mar45, hereafter 471st Amph Trk Co OpRpt. 14. Co C, 5th Tank Bn AR, Encl C, p, I, to 5th tank Bn AR. 15. 5th Tank Bn AR, p. 4. 16. LtCol Oscar F. Peatross ltr to CMC, dtd 23Dec52, in Iwo Comments. 17. Newcomb, Iwo Jima, p. 119. 18. Conner, The Fifth Marine Division, p. 53. 19. Proehl, The Fourth Marine Division, p. 149. 20. 4th MarDiv OpRpt, Anx F, p. 9. 21. 4thMarDiv OpRpt, Anx H, p. 1. 22. Colonel Justice M. Chambers ltr to CMC, dtd 5Nov52, in Iwo Comments. 23. 4th MavDiv OpRpt, Anx H, p. 2. 25. 14th Mar OpRpt, App. 6, p. 3. 26. "It was realized by VAC that there was much confusion and congestion on the beaches as D-Day wore on, but it was considered essential to avoid confusion afloat also, and Divisions were requested to get as many troops ashore as possible on D-Day, and to prepare for the anticipated banzai attack that night. We had more troops on the island by nightfall than the enemy had all told." Rogers ltr. 27. Additional material in this section is derived from: 28th Mar AR, 19Feb-26Mar45, in 5th MarDiv AR, Anx S, hereafter 28th Mar AR; 28th Mar UJnl; VAC Rpt on Night Operations, Iwo Jima, 12Aug45, hereafter Iwo Jima Night Ops Rpt. 28. VAC G-2 PerRpt No. 1, dtd 19Feb45. 29. TF 54 OpRpt, p. 13. 30. Lieutenant Colonel Fenton J. Mee ltr to CMC, dtd 15Dec52, in Iwo Comments. 31. Casualty figures taken from statistics prepared by the Casualty Section, HQMC. It should be noted that in the confusion of D-Day, casualties were thought much more severe than was actually the case. 1/28 alone reported 600 missing. However, many of these men had returned by D plus 2. They had been fighting with other companies and in some cases other regiments. 28th Mar AR, p. 17. 32. VAC AR, Anx B, Encl 4, p. 12. 33. 28th Mar AR, p. 17. 34. Newcomb, Iwo Jima, p. 135. 35. Excerpts from Masanori Ito, Fall of the Imperial Army (Teikoku Rikugun No Saigo) v. IV, pp. 55-110), in Newcomb Notes, hereafter Ito, Fall of the Imperial Army. 36. Robert Sherrod, as cited in Ibid., pp. 136-137.